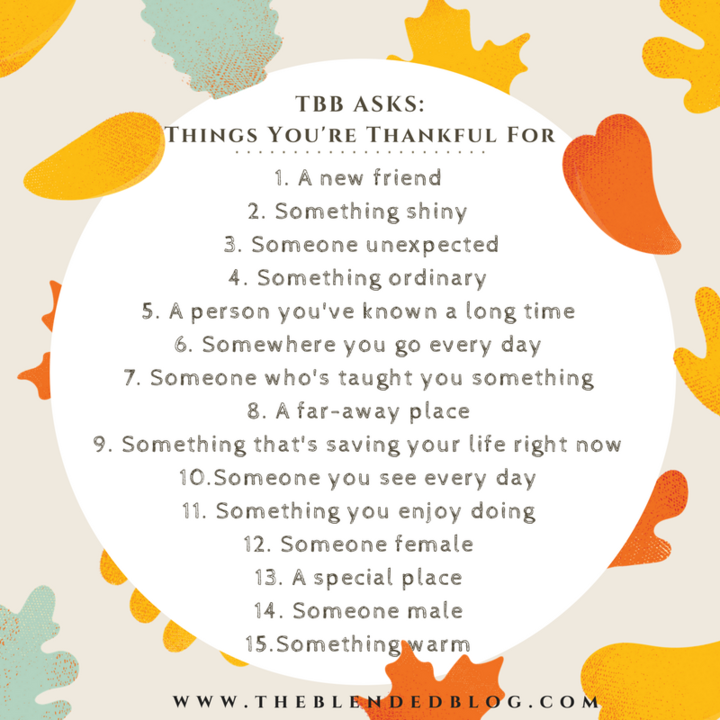 I think I've finally recovered from Vegas...at least enough to thoughtfully answer this month's questions from The Blended Blog Asks. My goal in November is to focus on the joy of THIS season, a time for thanksgiving, before the craziness of Christmas sets in. Here goes! One / I love all my blogger friends, and this year I've been very fortunate to meet some local Seattle ladies who share my passion for fashion. They're all creative and fun and have unique style. You'll want to follow Dawn, Bethany, Lisa, Christina and Valerie. Two / It's hard to think of something shiny that doesn't have to do with Christmas - which I'm not focusing on right now. I am thankful that I got my shiny anniversary band in for repairs before one of the stones fell out. Three / Last year my Uncle Rick passed away. We were really close, and he was a big source of guidance in my life. Recently his brother, Uncle Larry, has stepped into that role, and we've been able to strengthen our relationship and be a comfort to each other. Four / I'm so thankful for my ordinary little life. It's not glamorous or fancy, but I love every part of it. Five / When my boys were small, we got new neighbors with girls the same ages, and we spent a lot of time together. Over time we moved away and lost touch, until a few years ago when we reconnected. Mikki and I have so much in common and love getting together for lunch and venting about our kids and husbands and wrinkles. Six / My comfy bed. It's the coziest, and I can't wait to get into it every night. Seven / Our friend Todd, who was paralyzed three years ago, and told that he would never walk again. You guys...he came over for dinner last night, and walked from his car to the house. Yes, he leaned on my husband for balance just in case, but he moved one foot in front of the other and WALKED. I've learned so much about persistence and faith and attitude from that man. Eight / The little college town where Thomas goes to school. Although I wish it was closer, he's so happy there and it's the perfect place for him. Nine / Working out every day. I've been super consistent since starting The Faster Way To Fat Loss, and there's nothing better for anxiety and stress. Which I seem to have a lot of. Ten / My husband. Since we own a business, we see each other A LOT. Luckily we work well together, and there's nobody else I'd rather see all day, every day. Eleven / Reading. Give me all the books. Twelve / I can't pick just one, but I'm so grateful for the female family and friends in my life. They listen to me when I'm crazy, and make me laugh, and help me be a better person. Thirteen / Our little beach paradise, Manzanita. Wish I was sitting there right now. Fourteen / Those special sons of mine. I can't imagine life without these two. Fifteen / Thank God for fleece. I need many layers this time of year to stay warm. I love my ordinary little life too, my family is my everything and you my friend, are the sweetest with the most grateful heart!! Have a beautiful weekend!! I love my ordinary life too. I love that we met through blogging and have created this wonderful community together. You are beautiful both inside and out pretty lady! Have a wonderful weekend! I love this thoughtful and reflective activity. I enjoyed learning a little more about your life through reading your answers. I find lately I am slipping at carving out time to read for pleasure and it's something I also truly enjoy doing. Take care. I'm so glad you recovered! Welcome back! There's nothing better than a grateful heart and you certainly have one! Such a perfect list from a wonderful soul! Ordinary is definitely worthy of Thanks! OMG. Todd! That's amazing! He's truly a miracle and makes me believe in everything.